There is an even higher “Don’t know” than with the business size provision. QUESTION: Now, I would like to ask you about some provisions of the paid sick leave ordinance. 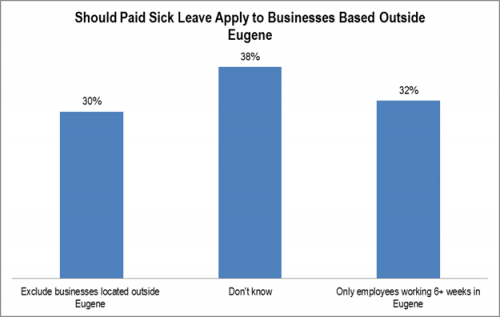 or would exclude only employees who work in Eugene less than six weeks per year for businesses located outside Eugene? METHODOLOGY: 200 live telephone interviews of likely City of Eugene 2014 General election voters conducted July 30-31, 2014. The margin of error at the sample median is plus or minus seven percent. Totals may not equal 100 percent due to rounding. Eugeneans tend to prefer that very small businesses be exempt. The city council chose not to. The high “Don’t know” perhaps reflects the perceived speed with which the ordinance was passed. This unfamiliarity with the basic issues would come from the resultant lack of debate. or would include only businesses with six or more employees? 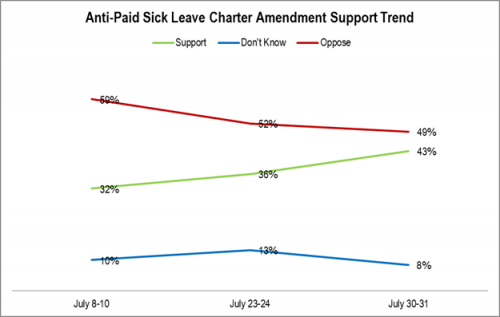 Support for a charter amendment against Paid Sick Leave jumped after passage. It is still not in a position to pass. However, it might be at some future date. QUESTION: If the election were held today, would you support or oppose a City of Eugene charter amendment that would overturn the ordinance and prevent the city from requiring businesses providing services within the city limits to offer sick time to employees on an annual basis? 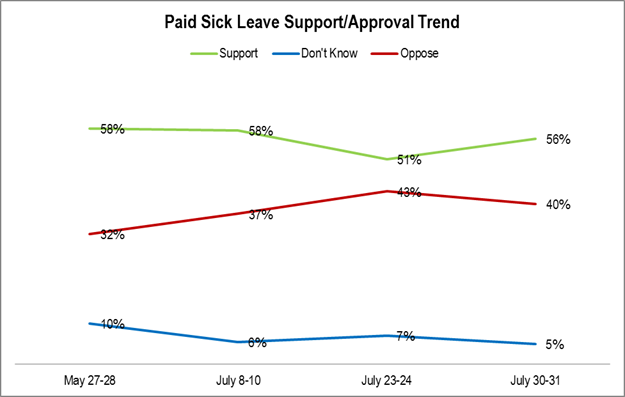 METHODOLOGY: 200 live telephone interviews of likely City of Eugene 2014 General election voters conducted July 8-10, July 23-24, and July 30-31, 2014. The margin of error at the sample median is plus or minus seven percent. Totals may not equal 100 percent due to rounding. 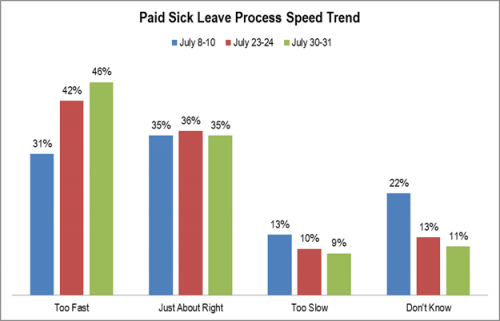 Those rating the Eugene Paid Sick Leave passage process too fast have increased significantly over time. QUESTION: Do you feel the City of Eugene moved too fast, too slow, or just about right passing the ordinance? The Paid Sick Leave ordinance enjoyed an uptick after passage by the city council. Usually, successes tend to increase support just as failures decrease support. The trend with the LTD West Eugene EmX noted earlier is an example. Worrisome for supporters is that the support/approve percentage has never reached 60 percent since the issue became widely known. METHODOLOGY: 200 live telephone interviews of likely City of Eugene 2014 General election voters conducted May 28-29, July 8-10, July 23-24, and July 30-31, 2014. The margin of error at the sample median is plus or minus seven percent. Totals may not equal 100 percent due to rounding. 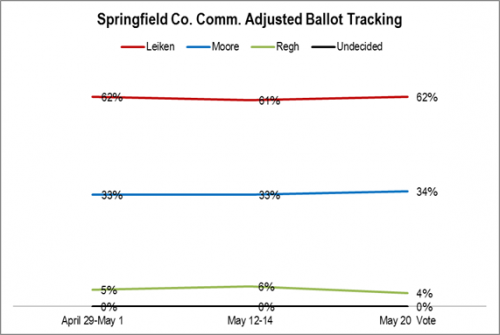 The calculation implies that Leiken was always hovering around his final percentage of 62 percent. See http://lindholmcompanyblog.com/?p=10694 for the original percentages. If the election for county commissioner were held today, would you vote for Sid Leiken, Sheri Moore or Charmaine M. Rehg [ROTATE]? 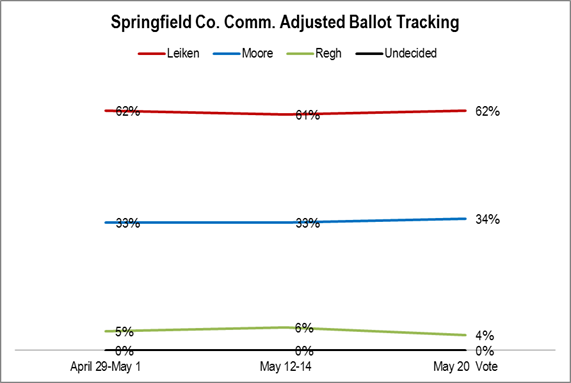 200 live telephone interviews of Springfield County Commission District likely 2014 Primary voters were conducted April 29-May 1, 2014 and May 12-14, 2014. The margin of error of the survey at the sample median is plus or minus seven percent. SOURCE OF ELECTION DATA: Lane County Elections. ADJUSTED BALLOT CALCULATION METHODOLOGY: The adjusted ballot standing is calculated by assigning the undecided percentage using a standard methodology. The undecided percentage was assigned with one third to the incumbent and the remaining two thirds divided proportionately among the challenger or challengers. 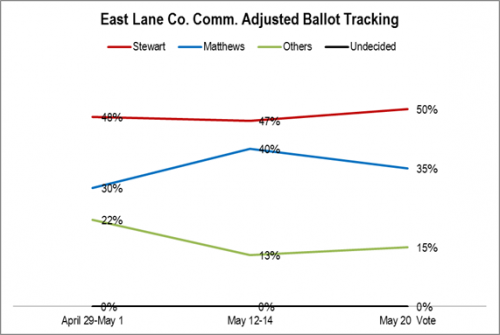 The adjusted ballot tracking shows that Stewart was always tracking towards around 50 percent. See http://lindholmcompanyblog.com/?p=10690 for the original numbers. If the election for county commissioner were held today, would you vote for Faye Stewart, Joann Ernst, Kevin Matthews, Jose Ortal or Jack Schoolcraft [ROTATE]? IF DON’T KNOW: Which way do you lean? This adjusted ballot percentages show that this race was always going to be close. See http://lindholmcompanyblog.com/?p=10672 for the original percentages. 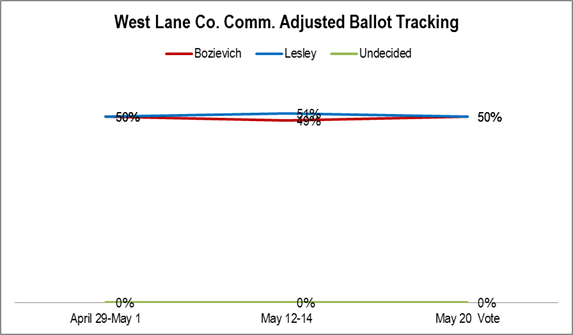 If the election for county commissioner were held today, would you vote for Jay Bozievich or Dawn Lesley [ROTATE]? 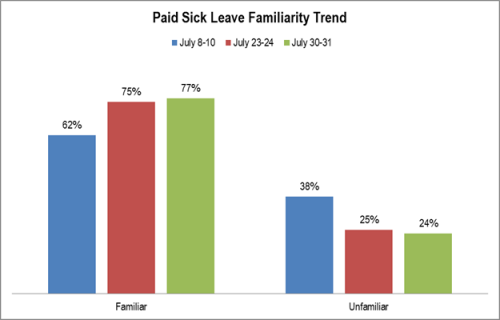 The past few weeks we’ve been looking at Paid Sick Leave. This week we’re going to get back to analyses of May’s county commissioner contests.